This Regal 4460 Commodore is in exceptional shape. She is owned by an experienced boater and has been very well maintained. Recent upgrades include new Eisenglass, trim tab indicators, electric grill, bottom job and a full exterior detail to name a few. Please take note that this boat has the bigger engines (IPS 600-435 HP) then most of the other 4460's on the market. 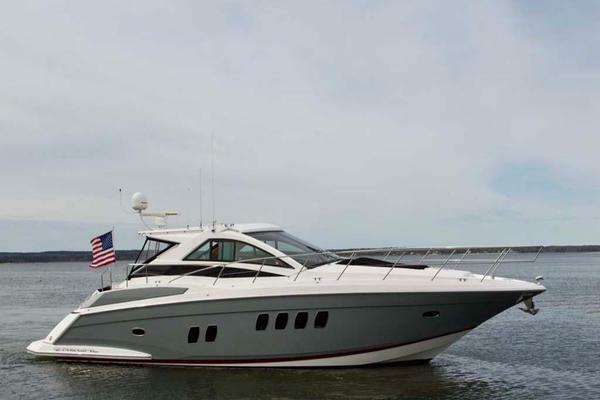 Whether you are looking to spend extended weekends on the water, cruise the islands or just have the perfect yacht for creating unforgettable memories with your loved ones, this Regal 4460 Commodore is the one for you. She is powered by twin Volvo 600 IPS diesels. If you're not familiar with the amazing maneuverability of IPS technology, a simple joystick control operates both motors simultaneously allowing you to move the boat effortlessly in any direction. This technology can make a novice boater look like a seasoned yachtsman. The spacious cockpit allows for plenty of room to entertain. You can enjoy a day on the water year-round with her fully climatized helm and cockpit. The helm area and cockpit are fully-protected from the elements by her enormous hardtop and there is also a walk-thru windshield for easy access to the bow. Below deck is a beautiful salon area with ample seating, screened hatches/portholes and complete galley. The dinette also converts into another berth and has easy stowaway for the cushions. The aft cabin has twin aft beds that can be converted to a single queen-sized berth with a cushion insert. It also has its own separate head with shower for privacy. The master berth has a high-quality mattress that will make you feel like you are at home, not at sea. Additionally, there is ample storage, cedar lined closets and a separate master head with shower. This Regal 4460 lives up to its regal name. The royal blue hull and sophisticated design are only the icing on the cake to her functionality and performance. If you think the pictures look great wait until you see her in person. The Regal 4460 Commodore is a 2 stateroom, 2 head and galley to starboard layout. The interior is beautiful with the cherry finish and lots of natural light provided by portlights and overhead hatches. The master stateroom is separated from the guest stateroom by the salon, allowing privacy for owners and guests. The well-lit master stateroom is forward with a queen island berth. The en-suite master head has a separate stall shower. Continuing aft is the large convertible sofa with dinette table to port. Opposite is the galley which is fully equipped and has plenty of storage. The guest stateroom is amidships with hard privacy door and en-suite guest head. The Master Stateroom forward boasts an extra-large berth with inner-spring mattress that is hinged for easy access to a large storage area beneath. The master head has an access door from the stateroom. The guest stateroom is located mid-ship, with a bulkhead and door for privacy. The special mid-cabin includes twin berths that can be converted to a single larger bed and a flat screen TV. The aft stateroom also includes a changing area with vanity plus there is room to put the optional washer/dryer. There is an en-suite head with shower. Access to the foredeck is via 2 molded steps on each side of the aft cockpit area. With a flick of a switch, the center section of the transom rises up, providing easy access to the engine room. The spacious cockpit includes wrap-around seating and table on the upper level, a full beverage and entertainment center and ample seating in the lower cockpit. This boat is also equipped with optional cockpit. Our Regal listing is a great opportunity to purchase a very nice 44' 4460 Commodore. 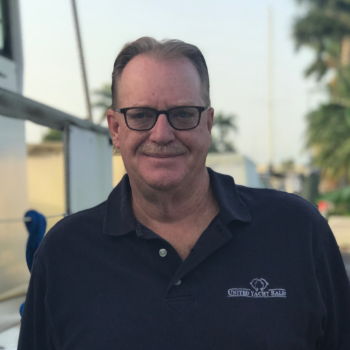 She is currently listed with United Yacht Sales broker Dan Morrison who can answer all questions about the boat for you. Please don't hesitate to reach out to our team of professional yacht brokers to schedule a showing. There are many yachts listed for sale on the MLS each with a different history. We look forward to helping you complete your search for the perfect boat or yacht for sale.